After finishing the Grudge trilogy, she then pursued a short-lived modeling career. I've seen her at the trailer park sitting in a folding chair drinking Busch Light with her feet in a dirty kiddie pool. Oh, come on everybody... he wanted to get a "MOM" tat, but he can't spell and his mom can't read..
Who ever she is... I wouldn't f--k her with his d--k! There are just no words to describe her beauty. 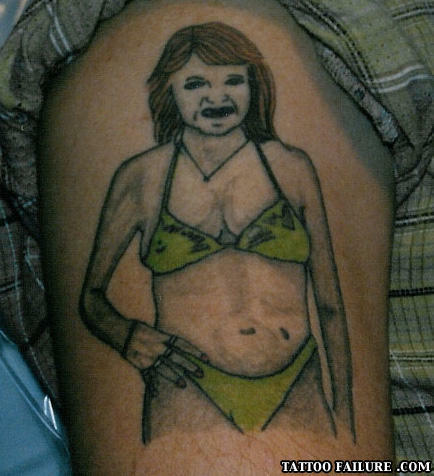 who wants a Angela Merkel in Bikini Tattoo? I saw this crackwhore in an episode of Beavis and Butthead. I would do he... ya.. really..
twelve beers ago i would've been disgusted. you can tell he was stoned when he saw the picture of his grandma on vacation.